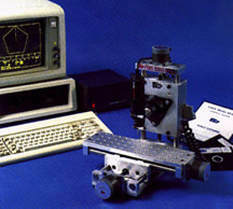 Minitech Machinery Corporation is a Georgia (U.S.A.) corporation which has been in the business of manufacturing CNC machines for over 20 years. Initial systems were sold to vocational and university level schools for CNC and CAD/CAM training. Now machines are sold to a number of markets including rapid prototyping, medical, small part production, jewelry making, and microfluidics research among others. Minitech has sold thousands of machines in over 30 countries worldwide, and aims to be the best manufacturer of desktop manufacturing systems in the world. The hand is the ancient symbol of peace and friendship, while the bolt is the international sign for machinery. Grouped together these symbols are our way of showing that we can provide peace and friendship with automated machinery. This concept has become our company motto and is symbolized by our logo. The Minitech logo and Minitech name are registered copyrights of Minitech Machinery Corporation © 1990-2018.